First of all I want to thank you all for the very sweet comments and email. This truly means a lot to me! Your encouraging words do help me and it is heartwarming to know that I have that many friends around the world. Although I am still very sad, I am trying to pick up my daily routine. 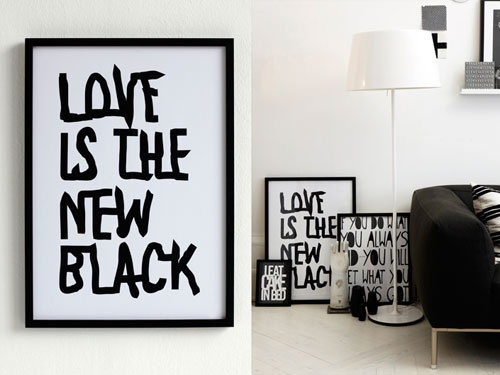 Today’s post shows a beautiful interior with the Love is the New Black print from Swedish designer Theresa Sennerholt. You can find more photos of this home in Stockholm, which is for rent, here (via Emmas Designblogg). Have a great Sunday! Nice to see you here Danielle… and I would say “Life is a new BACK”… enjoy this sunday! Take your time, your readears will always be waiting for you. Your blog is so special. All the best. Easy Danielle, take your time. We love you and your blog. A wonderful quote, love helps to make everything better. Where can I buy “Love is the new black”? Possibly on a tshirt, if possible. Although I would still buy the poster. fabulous one! love is everywhere, the best way to live life with pleasure , health and joy.